J&K Congress unit passes resolution calling for Azad to be handed charge of all Lok Sabha election work in the state. New Delhi: Jammu and Kashmir Congress leaders are irked with party President Rahul Gandhi for “sidelining” the former chief minister and senior leader Ghulam Nabi Azad from the state committees formed for the Lok Sabha elections. Gandhi had recently constituted different committees ahead of the polls where precedence has been given to Congress president G. A. Mir, former union minister Saifuddin Soz and former MP Tariq Hamid Karra. 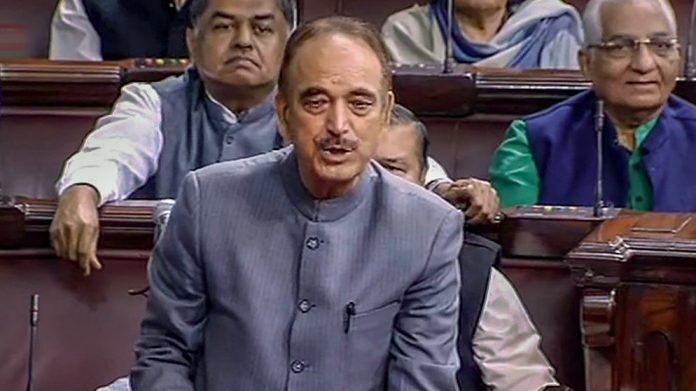 In response, the state Congress passed a resolution Saturday demanding that Azad, who is also the Leader of Opposition in the Rajya Sabha and AICC general secretary, be given the full charge of handling the party’s election in J&K. Former legislators, vice-presidents, general secretaries are part of this resolution. Monga added that there has been no response from Delhi so far. The state Congress has argued that the top party leaders must keep in view Azad’s “experience and developmental” work done during his tenure. Azad was the chief minister during the PDP-Congress coalition government that fell apart when the PDP withdrew support over the Amarnath Land row in 2008. A party insider who works closely with him, however, said Azad does not want to talk about the issue publicly.